Andy Warhol was the American artist who rose to fame during the 60's and 70's as one of the leading figures of the pop art movement. 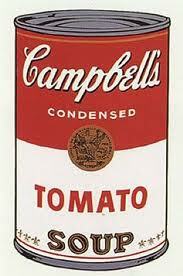 Who hasn't seen his Campbell's soup can canvas or his pictures of Marilyn Monroe and Elvis? However, his main contribution to our culture, at least for yours truly, is his celebrated quote about fame. Fame... ah, that which is considered fleeting but so sought after. Obviously the idea that people will seek out fame and maybe do anything to get it is nothing new. Today's modern age has merely brought the idea to our homes thanks to technology, thanks to reality TV in HD and the Internet. Of course TV represents the networks attempting to drum up revenue through advertisement with shows aiming to attract a viewer audience. It seems that over the past few years, reality TV has captured our attention and what's better for the networks is this type of show is apparently inexpensive to make. Ooo, a better bottom line. If you can't get your income up, lower your expenses! The Internet, on the other hand, is the do-it-yourself form of putting yourself out there. YouTube, Facebook, Flickr, we have a myriad of ways to publish ourselves, to expose ourselves to the world for that elusive moment of recognition. Ah yes, how we seek our fame. My wife and I made a trip to the Big Apple back in 2008. New York, New York: the city so nice, they named it twice. For a lark, a few weeks before the trip, I went to the CBS web site and requested guest tickets for the Late Show with David Letterman. You never know. Exactly 3 days before our departure, we get an email saying we have tickets and a date and time to show up. Well, it turned out to be a bit of experience being in the studio audience and seeing a live taping of a show we had seen about a zillion times at home. As you may or may not know, Letterman starts the show by doing a monologue. At the end of it, there is a commercial break but just before the break, the camera will pan across the audience as the announcer says something like, "We'll be right back." Before leaving on vacation, I had made sure our recorder was set up to tape the show. It ended up that we were seated in the second row right smack in the middle of the theatre but we had no idea if we would be seen or not. When we got home we watched the tape and much to our delight, at that break when the camera panned across the audience, my wife and I were clearly visible on screen for a second. This was hilarious. We had a great time replaying the tape for our family and a few friends showing our "guest spot" on the show. I had to add the reference to Andy Warhol's quote by saying that after this shot which lasted a mere 1 second, my calculation was that my wife and I still had another 14 minutes and 59 seconds of fame to look forward to. As I have perused the paper and channel surfed over the past couple of years, looking at the various people and the circumstances which have warranted the attention of the public, I have wondered just what my 15 minutes will be. I think of examples of wonderful moments: person saves cat from tree; Good Samaritan stops to aid injured person; somebody does something to raise money for charity; these are the type of things one would be proud of. There are also examples of bad moments: drunk driver mows down pedestrian; person sets building on fire; police capture abusive husband who has battered his wife and kids. These are the life altering events you want to stay away from as far as possible. So, as I sit here mulling over this fleeting thing called fame, I wonder just how will my 15 minutes pan out. Will it be a good thing or will it be for something that afterwards I am not going to be too proud of. As I watched the young man tumble off the roof of the moving car and badly scrape his arm on the pavement - he was lucky he didn't break his arm - I was thinking about this lapse of good judgement and how the guy at some point later, maybe in viewing the video clip of this stunt, would think that this wasn't exactly a brilliant thing to do. It seemed like a good idea at the time. George Clooney is world famous. Not only is he an actor, he is a producer, director and screenwriter. Same thing for Ben Affleck. These people are celebrities and deserve their fame. Note that I haven't touched upon other people like Al Gore, Nelson Mandela or Bill Gates who are also famous but who may not be what we would think of as a celebrity. I glance at the front page of any of the tabloids one finds in a supermarket checkout and I see the names of people who are milking their 15 minutes for everything they got. Somehow this strikes me as an ignominious shot at fame. Who cares? Do these people truly bring something to the table or are they famous merely for being famous? I always remember Zsa Zsa Gabor as a media personality who may have started out as a minor actress getting her foot in the door so to speak by marrying the actor George Sanders, but ended up later in life merely being a recognizable personality who was really doing nothing of merit. Famous for being famous; the Zsa Zsa factor: I can think of various names like Paris Hilton, Nicole Richie, Kevin Federline or Kato Kaelin. What's up with this Snooki from Jersey Shore? Who cares? The other week, I walked over to Kensington Market in downtown Toronto. I strolled around undisturbed. I visited My Market Bakery and picked up a half dozen Urban bagels. I stopped at the little coffee stand at the corner of Augusta and Baldwin and sipped a latte while watching the various people pass by. In other words, I went about my day unrecognised, without the slightest fame. I was reminded that being a nobody or at least an unknown somebody had certain advantages. Maybe I wasn't going to the head of the line like an American Express ad, but I was able to walk around unmolested by the public. In reading about various celebrities and their horror stories of dealing with paparazzi, I can't quite imagine the frustration if not outright anger of having every moment of the day disturbed by the unwanted intrusion of some well-meaning passer-by who wants to say hello not really to you, but to some character you may have played on TV or in a movie. No wonder Michael Jackson had to travel with a pack of security guards. It seems to me that anonymity is freedom. In the future; everyone will be famous to fifteen people. What an interesting guy you are! Really enjoyed reading this, certainly helped get my mind around the author (you). I had my fifteen minutes of fame once, I was in a supermarket and a young girl called Claire (will not forget her name) came upto me while I was shopping, I saw her about a minute before hand whispering to her perents and a friend. She then came running upto me, asking for my autograph and telling me she loved me, and not letting me have the chance to speak! She though I was an actor out of Hollyoaks, the name has left my memory completely, but before I had a chance to explain, half of the supermarket was running upto me asking me for the same thing! To save embarresment I squiggled an unreadable signature on everyones paper and just said 'oh thank you' about 20 plus times. Weird and Sureal but that was my biggest fifteen minutes of fame, people taking pictures and asking me for autographs thinking I was someone else!